NEW PRODUCT – RF Touch Wheel Controller for Analog RGB LED Strips « Adafruit Industries – Makers, hackers, artists, designers and engineers! NEW PRODUCT – RF Touch Wheel Controller for Analog RGB LED Strips. This touch controller set is a quick and easy way to control a bunch of our 12V analog RGB LED strip. The box part contains power driver circuitry and an RF receiver. The handheld remote contains a capacitive touch interface and an RF transmitter. By wiring the analog strip to the box you can easily adjust the color from across the room. Since it it is RF you don’t need line-of-sight like you would with an IR Remote. The box has a few ‘programs’ built in, such as rainbow fading and a really obnoxious colorful blinking effect. However, you’ll probably end up being very happy with the basic control system that the remote allows. You can turn it on or off by pressing the power button, change the brightness by pressing B+ or B- and select the color using the scrolling color wheel. JST Plugs and JST Receptacles – for quick connecting LED strip segments. 2.1mm barrel jack adapter will let you solderlessly connect the 12V power adapter to the RGB controller box. LED strips! 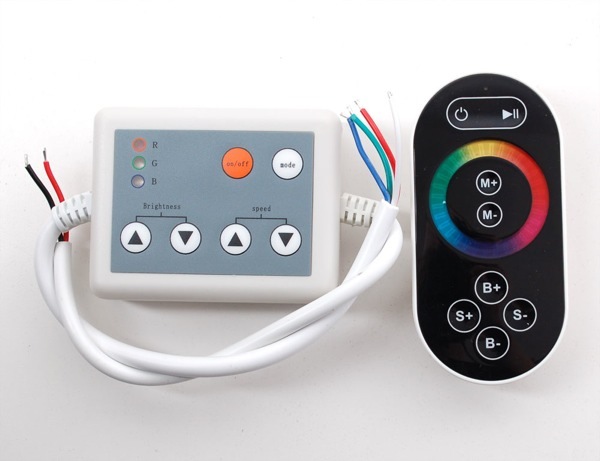 You can use this with our 60 LED/meter RGB, 30 LED/meter RGB or 60 LED/meter warm white. Oh … I so need one of these so that when my daughter doesn’t listen I can put on my Angry Dad voice and make the entire room turn red! So whats it look like inside? Whats the hackability? of both ends. Frequency of the RF? Control sequence cracked yet? Could be lots of fun for adding the analog tape to my interactive led setup, but I dont have time to dig up all the details myself before SourceMaui.com in late Feb.
@jerry – we’ll crack one open later, or what’s more likely, a cool customer will and post about it!